Yet another sport treated to the Now brand, 2017 Topps Now UFC deviates slightly from the norm but is still likely a familiar sight to the on-demand collectors. 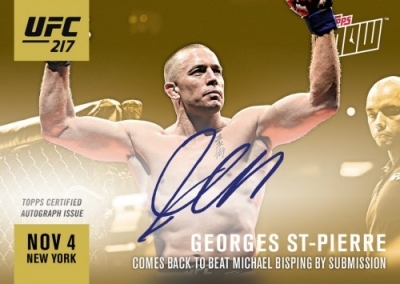 Released following various Ultimate Fighting Championship events, the 2017 Topps Now UFC checklist normally highlights the winning fighters with a horizontal design layout. These cards are sold through Topps for a 24-hour period before being removed from the site. At that point, only the orders are printed, and that final number is announced. Just like in the 2016 debut set, 2017 Topps Now UFC differs from the other Now products because the card numbering does not build upon itself like a traditional base set. 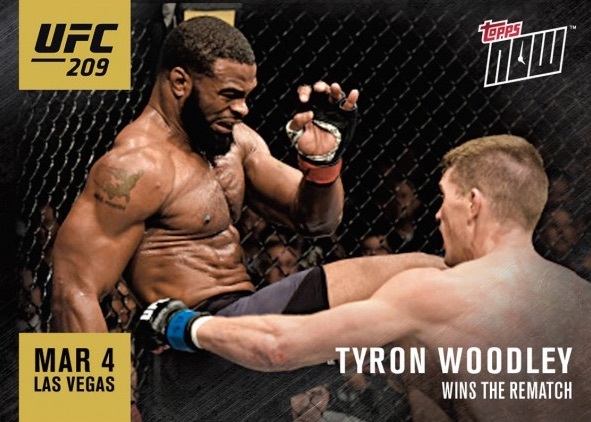 Instead, each set is centered around the particular UFC event it covers, with a letter indicating the specific card (i.e. #209-A). In this aspect, it is more like many separate sets. To help keep things clear, the cards are grouped by year. As a result, every card covering 2017 UFC events can be found here. Because of inconsistent releases, there are large gaps between sets. In addition, although Conor McGregor is a well-known MMA fighter, his mega-bout with boxer Floyd Mayweather Jr. warranted real-time card coverage but is separate from the Topps Now UFC line. 2017 Topps Now UFC pricing starts at $9.99 for each individual release but the per-card price drops as larger amounts of each card are ordered. Limited autographs are much more expensive. Following each UFC event, more cards will issued and they will be added to this guide along with the print run. 2017 Topps Now On Demand Floyd Mayweather Conor McGregor #3 #1 Of 25! 2017 Topps Now On Demand Floyd Mayweather Conor McGregor #12 #9 Of 25 Made! Autograph Versions: Blue #/49, Purple #/25, Red #/10, Orange #/5, Yellow 1/1.